Using mortuary sites as evidence for reconstructing social organization in the past is not a new field of study. It became popular in the 1960’s through 1980’s during the New Archaeology era. In 1971, Binford argued that the study of mortuary sites was important because one could determine the social structure of the society from study of the artifacts and burials. Differential treatment of the body, varying facilities of disposal, and variation in the grave goods, were all signs that individuals had different social personae. By presenting burials as a reflection of structure rather than ideas, it gave archaeologists a way to integrate this form of evidence into systems theories and a solid piece of evidence that could be recovered unlike belief systems. Binford (1971) argued that the higher status an individual was the more people would be invested their burial. Tainter (1978) used this to create an analysis of energy expenditure, whereby more energy was used in burials for higher ranking individuals. Peebles and Kus (1977) argued that different clusters of grave goods with burials meant different statuses, which could either be ranked vertically or due to different horizontal group associations. However, as noted by Carr (1995), the ‘excavation’ of social systems is just as difficult as the ‘excavation’ of belief systems. Determining status and rank requires careful contextual interpretation. The problem with studies like Binford, Tainter, or Peebles and Kus, is that they do not consider evidence beyond the burial, grave goods, and immediate location. Focusing completely on social organization means losing sight of other potentially important variables. Spatial relationships need to be determined, as well as the potential symbolic meanings of the burials. While social structure may frequently correlate with burial patterns, it isn’t necessarily the cause of the burials. It is important to consider the range of reasons behind certain burials including the social, the ideological and the environmental dimensions. Determining rank and status can be done, it just needs to be done carefully. Work by Morris (1992) looked at the use of terracotta jars in burials in Ancient Greece. He found that the jars found in tombs in Greece during the democracy, 500 to 425 BCE, were cheap replicas of the more prized marble jars. There was also a marked decrease in monumental tombs. Traditional studies interpret this as a decline in Greece, a possible failure of the economy. However, Morris argues that instead this represents an era of restraint, where mortuary ostentation was seen as being in poor taste. Instead of spending money on one’s tomb, the money would be given out for a public funeral where anyone could attend. This would increase the status of an individual in the public’s eye, rather than showing their status in death. Looking at the texts from the time period, as well as more general mortuary trends, one sees quickly that this was an era where more austere burials were seen as being representative of being a good citizen of the democracy. Money was meant for the good of the community, rather than the good of the individual. From Morris’ analysis, we see a reverse relationship from that postulated by Binford and other New Archaeologists. A deeper look at the burial context may reveal status differences, but in terms of burial goods less actually meant more. Another source of information often looked over in the past are the individuals themselves. Health is an important indicator of status, whether it be a lowered risk of infection, better access to medicine, differential access to food, or occupation. A new study by Watkins (2012) looks at the health of a historic skeletal collection. By looking at the variation in osteoarthritis (OA) patterns, the presence of enthesopathies, fractures and cause of death, she determined that there were two samples of skeletons from two very different social contexts. Based on the presence of mild OA and muscular stress, low disease and healed fractures in one group with a much higher age, he determined that these were individuals collected from an almshouse. The second group had a higher prevalence of OA and muscular stress, were effected by more diseases, and had worse fractures suggesting that they did not have the care of an almshouse, but were on their own. Looking at the social context of early 20th century Washington, DC (where the collection comes from), Watkins (2012) argues that the first group may have been connected to an almshouse where individuals could get care throughout their life, where the second group did not have this connection. While this group has been lumped together in the past as reflecting a poor population, a closer examination reveals internal diversity that is important for better understanding social conditions and structures. 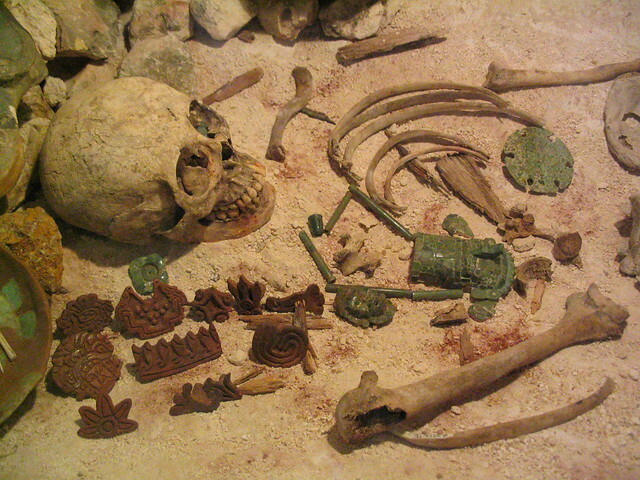 Rank and status can be determined from mortuary archaeology and human remians. One just needs to be careful, and make sure to look at a wide range of dimensions. Burial is about more than social structure or religion; it is a complex interplay of dozens of factors. Carr, C 1995. Mortuary Practices. In Journal of Archaeological Method and Theory 2(2):105-200. Peebles and Kus 1977. Some archaeological correlates of ranked society. In American Antiquity 42:421-448. Binford 1971. Mortuary Practices: Their study and potential. In Approaches to the Social Dimensions of Mortuary Practices. SAA 25: 6-29. Morris, Ian. 1992 Death ritual and social structure in Classical Antiquity. New York: Cambridge University Press. Nice post. Quick comment: R. Watkins is Rachel Watkins (and therefore not “he” above). Have you read the Archaeology of Rank by Watson? Haven’t read it yet, but its on a big list of archaeology books to read. Any chapter suggestions? @katy – it’s been so long (grad school) that I would have to go back and take a look at it. It’s now on paperback (thank goodness). That hardback was pricy!